SatTrackCam Leiden (b)log: Sense and non-sense about the X37-B "Space Plane"
Quite some non-sense is appearing on the internet regarding the USAF's classified X-37B "Space Plane". Most of this non-sense concerns the orbit of the X-37B and it's presumed extra "manoeuverability". Some typical examples can be found in the comments to this Slashdot coverage of the second X37-B flight (OTV-2), and I have seen similar misconceptions pop up in the comments to many other web-articles as well. 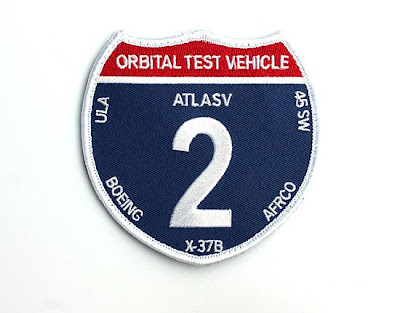 First: the claims that the current 43 degree inclination orbit for X37-B OTV-2 (and the 39 degree orbit for the previous OTV-1 mission) have been chosen to maximize coverage of a particular target, e.g. Libya. This "argument" stems from the difference with the more typical Polar orbit (60 to 90 degrees inclination) of reconnaissance satellites like the Keyholes and Lacrosses. However: in terms of reconnaissance opportunities for any given location within the bounds of the orbital inclination, a 43 degree inclination orbit gives you no advantage over a polar orbit. 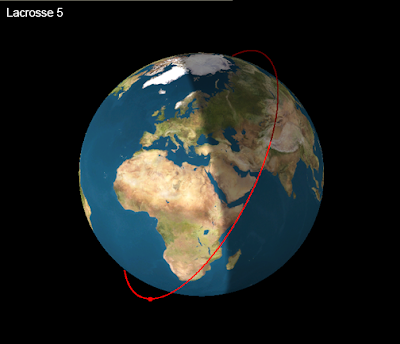 On the contrary, while a polar orbit brings any latitude within reach for reconnaissance, a 43 degree orbit does not, as latitudes above 43 degree are less well covered (and far North or South latitudes aren't covered at all). Note that for targets below 43 degree latitude, it really doesn't matter whether the satellite is in a 43 degree, 60 degree or 90 degree (polar) inclination orbit: all these orbits will bring such a target in reach, and the 43 degree orbit has no extra benefit compared to a 60 or 90 degree orbit at all in terms of target coverage. As can be clearly seen, the 43 degree inclined orbit of the X37-B does not result in many more passes compared to the other satellites in higher inclination orbits. 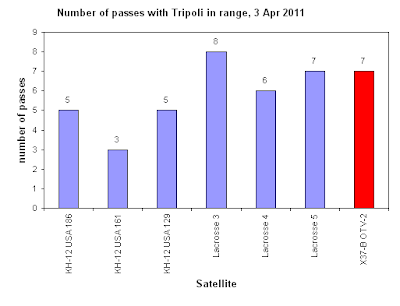 There is at best a marginal advantage over a true 90-degree polar orbit (the KH-12 Keyholes), but only marginal: and compared to the 57-67 degree orbits of the Lacrosses, the advantage in terms of number of passes over Libya is nil. 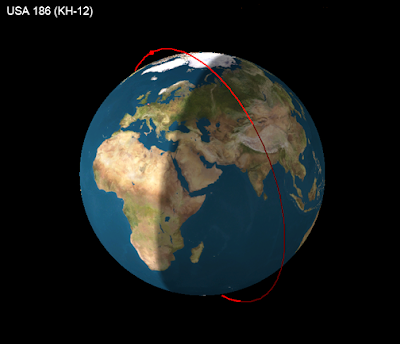 The maps below show the geographic coverage by a polar orbit (USA 186, a KH-12), a 57-degree orbit (Lacrosse 5) and the 43 degree orbit of the X37-B OTV-2. 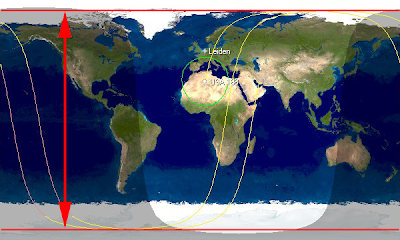 Limits of the geographic coverage of these satellites is indicated by the red lines: all locations inbetween these lines (the span of latitudes indicated by the red double arrow lines) get covered: where the limit is, is determined by the inclination of the orbit. As the earth surface rotates beneath the orbital plane, strips of land get covered orbital cycle after orbital cycle. The X37-B does this in the same way as the other, "conventional" satellites. 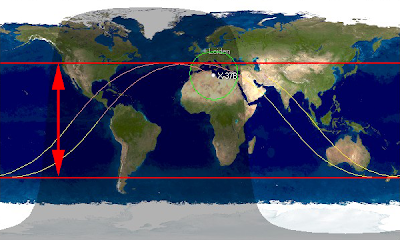 Any given location inbetween the red lines on the X37-B map gets as well covered by the other satellite's higher inclination orbits: see also the previous diagram. So it is nonsense to think that the 43 degree inclination orbit has been chosen to have a "better" look on a target near 43 degree latitude: a 90 or 60 degree inclination orbit will cover such a target just as well. Instead, the 43 degree inclination has probably been chosen to maximize coverage of the X-37B orbit by US tracking and control facilities. So, it is a very prozaic explanation connected to the experimental nature of the craft, and the fact that it frequently re-boosts (it has to: it is in a low orbit and hence subject to quick decay). 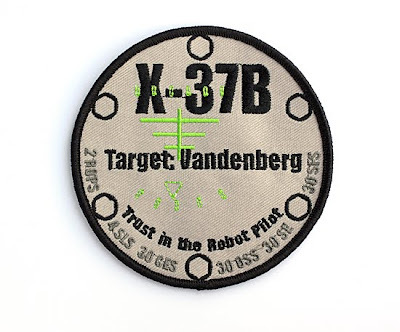 Another frequent non-sensical remark about the X-37B is that it supposedly would be "more manoeuverable" than the typical reconnaissance satellite: and somehow able to "quickly get over a target" if necessary. Again, this is a wrong view on how orbital dynamics and the dynamics of target coverage work. The X37-B might have wings and behave like an airplane in the atmosphere near landing: but in space, it is just a satellite subject to the same orbital laws as any other satellite. Like any satellite, it will cover any target within reach of the orbital inclination at least twice a day. And you just don't "steer" a spaceship to a target within an hour: it is not similar to flying an airplane (unlike suggestions in Battlestar Galactica or Star Wars). You change the orbital period and/or inclination and this determines when and how the satellite (X37-B in this case: but it is the same for any other satellite) will encounter a target, about twice a day (I say "about", because it actually concerns a number of passes centered on two times each day, 12 hours apart). The X37-B frequently makes small orbital maintenance manoeuvres (it has to, because of the quick rate of orbital decay at it's orbital altitude). Please note that, contrary to assumptions to the contrary often made, "conventional" reconnaissance satellites like the Keyholes and Lacrosses frequently manoeuvre as well. They have to, to maintain their orbital constellation, as zonal harmonics and atmospheric drag (even at their altitudes!) would quickly change their orbits otherwise, making them drift from the intended orbits. Nothwithstanding this frequent manoeuvring (they do so multiple times a year) they stay operational for many, many years (Lacrosse 2 was finally de-orbited last week after being operational for 20 years, with very frequent manoeuvering during those 20 years). So the X37-B doesn't really have much of an edge in sense of "manoeuverability" over any other satellite, contrary to what many people seem to think. 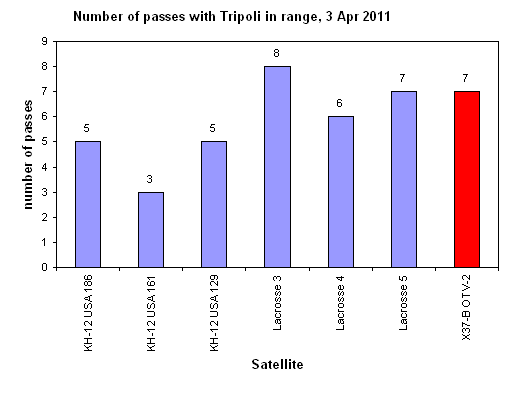 The same in the sense of the benefits of "land and refuel" capabilities: other reconnaisance satellites operate many, many years including frequent manoeuvering. The frequent manoeuvres the craft makes are manoeuvres to maintain orbital altitude and stay in a "frozen" orbit (an orbit that brings you over a target at the same time of the day, day after day, or each 2nd, 3rd or 4th day), and primarily this has to do with the low orbit (= high drag, high decay) the craft is in (this necessitates these frequent reboosts). It are not manoeuvres to change the orbit to quickly target new targets. That idea, is simply wrong and originates with people who have no clue about orbital dynamics in space. The only real edge the X-37B has over other satellites is that it enables you to sent up and then retrieve payloads. For the rest, it cannot do anything more than any conventional satellite can do.